Polypropylene pump tubes handle acids and other corrosive chemicals, have Hastelloy CÃ‚® shaft, TeflonÃ‚® and VitonÃ‚® seals. Bottom inlet strainer, 10Ã¢€â„¢ x 1" ID clear vinyl discharge hose. KynarÃ‚® (PVDF) pump tubes handle most organic solvents, freon, chlorines, alkalies. With Hastelloy CÃ‚® shaft, KynarÃ‚® and TeflonÃ‚® seals. 1" discharge outlet. Stainless Steel pump tubes have Carpenter 20 alloy shaft, KynarÃ‚® and TeflonÃ‚® seals. 3/4" NPT and 1-1/4" ID discharge outlets. Standard Electric Motor is 1150 watts, 115V, single phase, double insulated ODP. 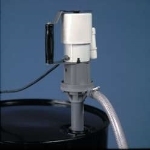 Delivers up to 43 gallons per minute (depending on pump tube) and up to 39Ã¢€â„¢ maximum discharge head. Large handle grip. Supplied with 15Ã¢€â„¢ power cord, plug and on-off switch. Safety manual reset circuit breaker. Explosion-Proof Electric Motor operates on 115V, single phase. Built-in switch, internal thermal overload device, and easy-carry handles. 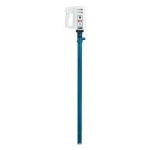 Delivers up to 35 gallons per minute and up to 37Ã¢€â„¢ maximum discharge head. Supplied with 15Ã¢€â„¢ of 3-wire power cord (no plug). UL Listed "Portable" Class 1, Groups C and D.
Air Motor uses 16 CFM @ 100 psi, delivers up to 25 gallons per minute and up to 23Ã¢€â„¢ maximum discharge head. Supplied with inlet air control speed valve and muffler. 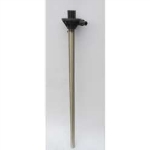 * Special pump tube lengths up to 96" are available.